During the course of a writer’s life, he or she will inescapably experience an array of apprehensive vibrations that accompany putting pen to paper when generating a story that is unobstructed and resolute. These indicators often provoke the writer’s resourcefulness and propel him/her to write a story that is candid and deliberate. The internal spark catches a blaze and the knees begin to shake and lock – but the soul surrenders. The unleashing of a chronicle, entrenched in soreness and authenticity, bequeaths the writer with a considerable sense of strength and freedom of the mind. It allows the writer to get naked and shed of the layers of ambiguity while beckoning the light to heal the wound. Surrendering requires acceptability and acceptability requires courage. When the soul of a writer bravely soars on the wings of a well-intentioned – or profoundly necessary story – it surrenders all to the universe in an effort to recount for episodes that are significant and influential to the journey of others, not just its own. Such was the objective of author, poet, historian, songwriter, playwright, dancer, stage and screen producer, director, performer, singer, and civil rights activist – Maya Angelou [born Marguerite Johnson]. 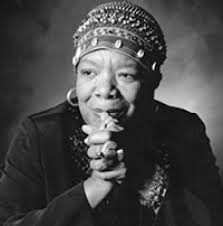 In her 1969 defiant autobiography, “I Know Why the Caged Bird Sings”, she demonstrates how the strength of character and a love of literature can help overcome racism and trauma. The power of literacy proved to Maya that people had stories and those stories had responsibilities – to be set free and embraced by the beneficiaries. Stories are the collective wisdom of everyone who has ever lived and the courage of everyone who has ever shared them. Storytelling requires audacity. One of the most powerful aspects I value in storytelling is that through the courage of a single writer’s voice – we get to seek our own. We get to see our story as a mirror in theirs. We find unification, deliverance and inner peace. And somehow, through the quiet of life these narratives allow us to breathe easier, to heal, and to seek refuge in a power that is greater than us. As a young girl in St. Louis and Stamps, Arkansas and after years of silence and detachment, poetry and storytelling became Maya’s passion. It was this fearless love that would bring Maya Angelou to become one of the most inspiring authors of our time. She dared herself to become someone. 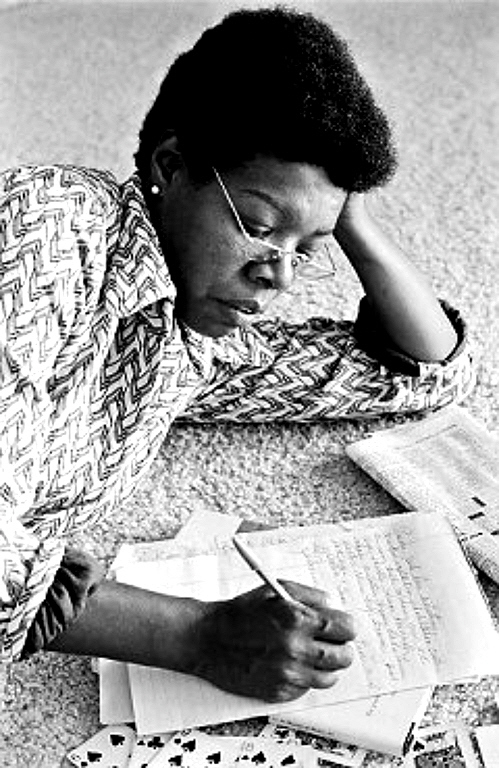 By age 40, finding the courage to write “I Know Why the Caged Bird Sings” was a welcoming undertaking for Maya. She was criticized by parents, teachers, readers, and writers alike for creating a book that was “censored”, honest, and “obvious”. Some have been critical of its sexually explicit scenes, use of language, and irreverent religious depictions. I imagine it required a lot of heart and bravado for Maya to compose and disclose a brutally honest story about her life through metaphorical lens. However, Caged Bird was nominated in 1970 for the National Book Award and remained on The New York Times paperback bestseller list for two consecutive years. Following Caged Bird, the first of her poignant autobiographical series, she wrote Gather Together in My Name (1974), Singin’ and Swingin’ and Getting’ Merry Like Christmas (1976), The Heart of a Woman (1981), All God’s Children Need Traveling Shoes (1986), Letter To My Daughter (2008), and Mom & Me & Mom (2013). Maya Angelou affected millions of women writers and authors of both the 20th and 21st Centuries, particularly African American women. Her measured verses have stirred our souls, energized our minds, and healed our hearts. Much of her work covers common topics known to and written by Black American women writers in the years following the civil rights movement. Her unequivocal stance to tell the whole truth challenged and transformed the usual structure of the autobiography by critiquing, changing, and expanding the genre. In essence, Maya taught us how to be resilient by opening the skylight of our minds so that they can blaze through the clouds like rainbows. She taught us that we all have something to give away – and to gain in return. Sometimes we find courage in the midst of incomprehensible chaos. At other times, we find courage in the silence of a storm. In any storm, writing is my soul’s safe abode. It renders me speechless and allows me to travel to many places, all at once. Like Maya has expressed in past interviews, there are rainbows all around us and we are never alone. I was “introduced” to her at age nine. Her employment of writing poetry encouraged mine and her very first poem I ever read was, “Oh Pray My Wings Are Gonna Fit Me Well”. During that time of my adolescence my [imagination] clouds were full of literary rainbows! As a young adult, prose written by Maya Angelou, James Baldwin, Langston Hughes, Paul Laurence Dunbar, Phyllis Wheatley and Gwendolyn Brooks changed the way I looked at fiction and nonfiction. Around 1986 and while beginning high school, I “returned” to understand her voice through literature in relation to dignity, how to cope with racism, the importance of family, and a quest for independence through self-definition. Who knew I’d be sitting in my high school library at age 15 reading, “I Know Why the Caged Bird Sings”, a book that revolutionized my thinking about racism and literacy. Days after the passing of Dr. Angelou and while honoring her in the silence, it all became so very clear to me. We are supposed to carry on this phenomenal legacy of purposefulness, truth, and grace. Writers must forever write, for it is through our employment that others often find their voice, their truth, their intent. And we must pass the torch along so that the vivacity of literature never dims. Literature is a treasure. Teaching is a gift. Inspiration is transmittable. 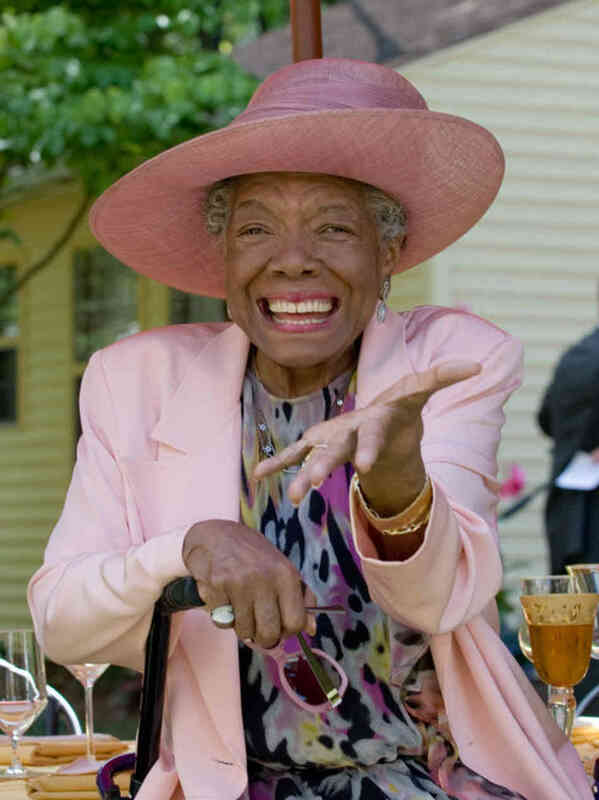 As a teacher, an example, a matriarch, a mentor – Maya Angelou gave us so much to move along for the future. She shared her grace. She taught us how to be courageous with our voices, wise with our thought processes, and transparent with our hearts. She gave us mantras to live by, narratives to engage, songs to sing, and meals to welcome at the table. Thank you, Dr. Angelou, for being our treasure and shining your light on our pathway. Because of you – we certainly can.